The first objective of this article is to clear up confusion over the locations of repositories of information on the history of Atlantis and its firestone. The confusion has been caused largely by statements made in a new ARE newsletter entitled, Ancient Mysteries.1 Unless otherwise indicated in the review comments below, we are referring to information given in the paper copy of Ancient Mysteries that was mailed to A.R.E. members who had signed up to receive this newsletter as part of their membership. In the section, "Hall of Records Update," we read, "Ancient Mysteries will provide updates on the search for Cayce's three Atlantean Halls of Records as information emerges." There is, however, only one hall of records mentioned in the readings. It is said to be on the Giza Plateau in Egypt. Ancient Mysteries goes on to claim that "Cayce stated the halls were located in Egypt near the Sphinx, underwater in the Bimini area, and in the Yucatan area possibly near the ancient Maya city of Piedras Negras in Guatemala." Those who have carefully researched the readings generally say, however, that if Cayce's source had meant Guatemala, Cayce would have said Guatemala, not Yucatan. As discussed later on, there is a repository containing the records of Atlantis in the ruins of Iltar's temple. These ruins are likely submerged on the Campeche Bank off Yucatan. A third repository is in the heart of the Atlantean land, on sunken Poseidia in the area of the Azores. This last repository has been slowly rising since at least 1939. When the editors of Ancient Mysteries say that a set of the Atlantean continent's historical records lies "underwater in the Bimini area," this conflicts with reading 2012-1 (see below). Two other readings relevant to this temple, 440-5 and 996-12, say only that "the records of the manners of construction" [of the great crystal] are to be discovered in a temple "near what is known as Bimini, off the coast of Florida," and that "a temple of the Poseidians was in a portion of this land" [the northwestern Bahama Bank near Bimini].Thus, the contents of the Bimini temple do not contain the records of the history of the Atlantean civilization. The temple there contains only "the records of the manners of construction" of the firestone. It is the temple in "the heart of the Atlantean land" (2012-1) that contains a copy of the Atlantean records. Ancient Mysteries also asserts that, "According to the readings, Bimini was near the place where the largest Atlantean island sank, about 10,000 B.C." Poseidia was that island. There are, however, no readings that say that Bimini was anywhere near Poseidia, Poseidia is assumed by most all students of the readings to have lain largely a little south and west of the Azores, some 3000 miles from Bimini. Again, reading 996-12 says only that the Poseidians had a temple near Bimini. The second objective of this article is to bring together The Hutton Commentaries' (THC's) latest thoughts on the specific locations of the records, and to speculate on where exactly, or how, these might be found. All of such thoughts are educated speculations, to be sure, and readers will have to deal with them accordingly. Here is the principal reading that sketches out the who, what, and where of preservation of the records of Atlantis and her civilization. Before that we find the entity was in the Atlantean land, when there were the constructive forces as to the activities of the children of the Law of One--in all of those influences during the periods when the land was being broken up. We find the entity was as the leading influence for the considering of ways and means in which there would be the preserving of records, as well as ways, means and manners in which either the few or the numbers might be preserved from the destruction of the lands. It would be well if this entity were to seek either of the three phases of the ways and means in which those records of the activities of individuals were preserved - the one in the Atlantean land that sank, which will rise and is rising again; another in the place of the records that leadeth from the Sphinx to the hall of records, in the Egyptian land; and another in the Aryan or Yucatan land, where the temple there is overshadowing same. Fig. 1. 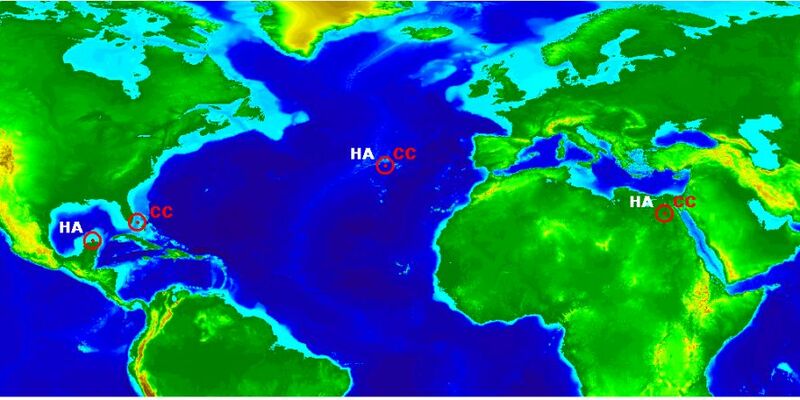 Locations Of Repositories of Records That Describe The History of Atlantis (HA) or Which Explain Procedures For Crystal Construction (CC). Patterns Indicate General Areas In Which Some Repositories Are Believed To Lie. Hall of Records in Egypt. We turn now to the deeply interesting reading for a man who in an Egyptian incarnation was Hept-supht, the sealer of the Great Pyramid. Not only does this reading explain what the records of Atlantis contain, it covers where the records lie, and who might appear to help find them. Edgar Cayce: Yes, we have those experiences of the soul-entity, the activities in the material,  - Hept-supht, in Egypt. At the completion of that called Gizeh, there was the mounting of that which completed the top, composed of a combination or fluxes of brass, copper, gold, that was to be sounded when all the initiates were gathered about the altar or the pyramid. And the sounding of same has become, as given, the call - in the varied lands - to prayer, or to arms, or to battle, or to service in any of the activities that became the guiding of influencing the masses in activity. In describing, then, the ceremonies of dedication or of the activities that began with the keeping of the lines of the priests and the initiates in the order according to their adherence to the law of one that was initiated in the activities of Hept-supht in this period, the sounding of the head or the top was given to one that acted in the capacity of the headsman - as would be termed in some of those activities of such nature in other portions of the country, or as nations rose in their service of such natures. And the Priest, with those gathered in and about the passage that led from the varied ascents through the pyramid, then offered there incense to the gods that dwelt among those in their activities in the period of developments of the peoples. In the record chambers there were more ceremonies than in calling the peoples at the finishing of that called the pyramid. For, here those that were trained in the Temple of Sacrifice as well as in the Temple Beautiful were about the sealing of the record chambers. For, these were to be kept as had been given by the priests in Atlantis or Poseidia (Temple), when these records of the race, of the developments, of the laws pertaining to One were put in their chambers and to be opened only when there was the returning of those into materiality, or to earth's experience, when the change was imminent in the earth; which change, we see, begins in '58 and ends with the changes wrought in the upheavals and the shifting of the poles, as begins then the reign in '98 (as time is counted in the present) of those influences that have been given by many in the records that have been kept by those sojourners in this land of the Semitic peoples. Then, the SEALINGS were the activities of Hept-supht with Ra-Ta and Isi-so [Isis and Iso. See 294-152, Par. 3] and the king Araaraart, when there were the gatherings of all the peoples for this record sealing; with incense from the altars of the Temple and altars of the cleansings that were opened for their activities in the grounds about this tomb or temple of records; and many were the cleansings of the peoples from those things or conditions that separated them from the associations of the lower kingdoms that had brought those activities in all lands of the worship of Baalilal [?] [Belial?] [Deut. 13:13] and of the desires as from carnal associations and influences. The entity Hept-supht LED in the keeping of the records and the buildings that were put in their respective actions or places of activity at this time. This was in the period, as given, of 10,500 years before the entering of the Prince of Peace in the land to study to become an initiate in or through those same activities that were set by Hept-supht in this dedicating ceremony. Q. If the King's Chamber is on the 50th course, on what course is this sealed room? A. The sealed room of records is in a different place; not in this pyramid. Q. Give in detail what the sealed room contains. A. A record of Atlantis from the beginnings of those periods when the Spirit took form or began the encasements in that land, and the developments of the peoples throughout their sojourn, with the record of the first destruction and the changes that took place in the land, with the record of the SOJOURNINGS of the peoples to the varied activities in other lands, and a record of the meetings of all the nations or lands for the activities in the destructions that became necessary with the final destruction of Atlantis and the building of the pyramid of initiation, with who, what, where, would come the opening of the records that are as copies from the sunken Atlantis; for with the change it must rise (the temple) again. Between, then, the Sphinx and the river. Q. Should or will I have anything to do with the opening of the sealed room in the present? A. As we find, if the activities are carried forward by those associations and connections with the entity's or soul's activities (as an entity in material forces), there will be an association and a connection with same beginning in '48. Q. Am I the one to receive directions as to where the sealed room is and how to find it? A. One of the two. Two, with a guide. Hept-supht, El-ka (? ), and Atlan. These will appear. Q. Were there any musical instruments sealed in that room? A. Many; not only those used in the Temple Beautiful in the temple service but those that aided in the service for those that danced, in their show of service in the temple. These, that were used then: The lyre, the harp, the flute, the viola. Ahmed Fayed, ARE expert on the Giza monuments and a licensed Tour Guide, has suggested to THC that there may be a tunnel (the "connecting chambers" from the Sphinx's right paw?) running easterly from the Sphinx to a small temple directly in front of the Sphinx; that is, the tunnel would transit part of the area "between the Sphinx and the river." This is an area that has never been fully excavated, although such was tried in the 1920s. Work had to be stopped, however, because water encroachment was an unsolvable problem. Fayed feels that because of the construction of the high dam at Aswan on the Nile in the 1960s, water levels in the vicinity of the Sphinx have by now fallen sufficiently to conduct subsurface investigations, as shown in the red area of Figure 2. Fig. 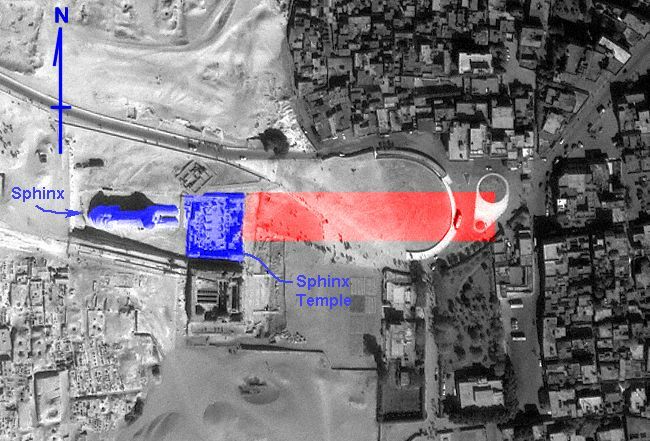 2 Satellite Image of the Sphinx and the Sphinx Temple (blue area) including an area directly in front of the Sphinx (red area), some of which has never been excavated. Yucatan Repository. Here are the readings that discuss the location of the repository for Atlantean records on the Yucatan peninsula. These records were carried from crumbling Atlantis by Iltar and placed in a temple he had built there, most probably on what is now a submerged area known as the Campeche Bank. Then, with the leavings of the civilization in Atlantis (in Poseidia, more specific), Iltar - with a group of followers that had been of the household of Atlan, the followers of the worship of the ONE with some ten individuals - left this land Poseidia, and came westward, entering what would now be a portion of Yucatan. And there began, with the activities of the peoples there, the development into a civilization that rose much in the same matter as that which had been in the Atlantean land. Others had left the land later. Others had left earlier. There had been the upheavals also from the land of Mu, or Lemuria, and these had their part in the changing, or there was the injection of their tenets in the varied portions of the land - which was much greater in extent until the final upheaval of Atlantis, or the islands that were later upheaved, when much of the contour of the land in Central America and Mexico was changed to that similar in outline to that which may be seen in the present. The first temples that were erected by Iltar and his followers were destroyed at the period of change physically in the contours of the land. That now being found, and a portion already discovered that has laid in waste for many centuries, was then a combination of those peoples from Mu, Oz and Atlantis. A. As given, that temple was destroyed at the time there was the last destruction in Atlantis. Yet as time draws nigh when changes are to come about, there may be the opening of those three places where the records are one, to those that are the initiates in the knowledge of the One God. The temple by Iltar will then rise again. Also there will be the opening of the temple or hall of records in Egypt, and those records that were put into the heart of the Atlantean land may also be found there - that have been kept, for those that are of that group. Q. The center or beginning of these projections was in Atlantis? Now if the 'the land [of Yucatan, see 5750-1 above] was much greater in extent until the final upheaval of Atlantis" and if Iltar had built his temple containing the Atlantean records on this land, which is now submerged, it only makes sense that the ruins of this temple "will rise again" when something like THC's postulated 1° pole shift down the 60°W meridian occurs. This is so because such a pole shift will cause sea-level to fall sufficiently to expose the Campeche Bank (Fig 2), where we assume that Iltar's temple was built in the first place. Fig. 3.Map Showing Land-Sea Boundaries Immediately After A One-Degree Pole Shift To 89.0°N, 60.0°W. Atlantis Repository. We have been unable to find additional readings on the location of the repository on Atlantis, said to contain the records of the history of Atlantis. However, we will assume, as I did in Coming Earth Changes,2 that N. Zhirov's location of Poseidia3 between roughly 3° and 45°N, and 23° and 43°W, is correct. And if Poseidia was at this location during the final years before submergence, when the records of the history of Atlantis were being written, we can further assume that the Atlantean repository for these records will be found in the area shown by shading on Figure 4. This Atlantean records repository will be found in a specific temple "where a portion of the [submerged Atlantean] temples may yet be discovered." (See 440-5 below). 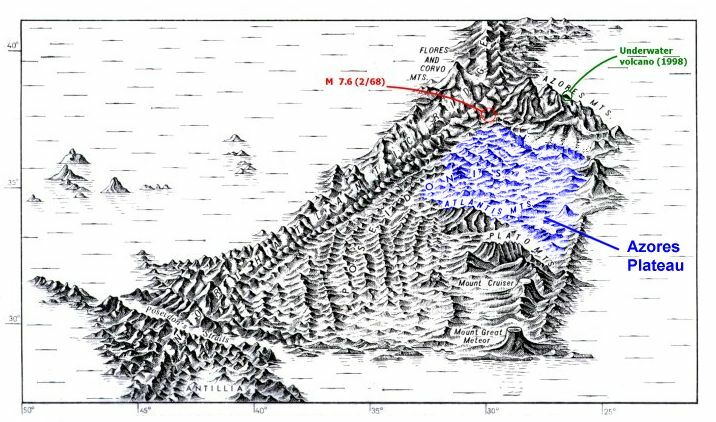 In attempting to speculate further on the location of this Atlantean temple, we find the following information from p. 363 of Zhirov's book tantalizing. It seems that in May 1968, Dr. R.
"The Danish engineer, M. Frandsen, was looking at a depth-chart of the Azores and observed that at a depth of 600-700 fathoms (3600 - 4200 ft) above the surrounding sea-bottom there was an even plateau to the south of the islands. As an experiment, Frandsen made a sketch with the measurements of the Atlantis Plain given by Plato, viz., 400 by 600 kilometers (250 by 375 miles) [Frandsen counted a stadius as 200 meters] and on the same scale as the chart. It fitted very well to the submarine plateau-land of the chart. By studying the depth-curves he found the declination of the plateau to be on an average 1:900; the plateau consisted accordingly of a real plain of a size about 2/3 of present-day Finland. On his sketch he drew in the contours of the mentioned canals and the circular ditch and likewise the squared lots of 'ten stadia each way.' According to Plato, the surrounding ditch had a length of ten thousand stadia (about 2,000 kilometers) and the number of squared lots was 60,000. By measuring the ditch on his sketch, Frandsen found it to be 2,040 kilometers and the number of lots to be 60,700, an acceptable difference. Having worked with irrigation in open and closed canals for thirty years he wanted to control the declination of the water level in the canals if adequate. He found the fall of the water to be 1:300 and 1:600, which according to modern principles is acceptable, although barely for the last figure. The current in the canals was accordingly too slow to cause difficulties of navigation for the row-galleys of the time." If this plain housed the last portion of Atlantis to sink beneath the sea, we might expect that it held the major temples as well. This area of the Atlantic seafloor looks like a very interesting one for oceanographers to explore. Of The Great Crystal, Or "Firestone"
Here is the reading for the gentleman who in a former incarnation on Atlantis had been involved with the use of the firestone, or great crystal. This energy-concentration and energy-transmission device was also known in those times when it was employed for destructive purposes as "the terrible crystal." I have added numbers in brackets to help readers separate the phrases that describe the three different prime locations of crystal-construction information. As indicated, the records of the manners of construction of same are in three places in the earth, as it stands today:  In the sunken portions of Atlantis, or Poseidia, where a portion of the temples may yet be discovered, under the slime of ages of sea water -  near what is known as Bimini, off the coast of Florida. And  in the temple records that were in Egypt, where the entity later acted in cooperation with others in preserving the records that came from the land where these had been kept. Also the records that were carried [by Iltar?] to what is now Yucatan in America, where these stones (that they know so little about) are now - during the last few months - BEING uncovered. And these records are specific to the methods of construction of the great crystal, or firestone. We don't know just where this temple is located, but since its location is to "rise amongst the first" during pole shift, we may not have long to wait before it surfaces. Jonathan Eagle, THC's Webmaster, thinks that the temple may lie in the shallow waters surrounding Bimini. As shown in Figure 3, if the poles undergo just a one-degree shift to 89.0°N, and somewhere between about 60.0 and 80.0°W, sea level in the Bimini region will suddenly drop. This will expose the former surrounding sand bottom to erosion by rains and the temple will be exhumed; that is, in the language of the readings, it will "rise." [Note: THC has run its pole-shift model for only two cases so far. Those cases were for shift meridians located on the 60.0 and 79.2-degree west longitudes. Any pole shift down a meridian between 60 and 80 degrees west will accomplish the change in Earth's sea-level geoid mentioned here for the Bimini region. See our articles on pole-shift modeling and associated worldwide effects under the heading "A Small Pole Shift Can Produce Most, If Not All, Of The Earth Changes Predicted In Cayce's Readings" and "Calibrating The Hutton Commentaries' Model For a 1° Pole Shift to 89.0°N" in our Members section]. Under the heading of Bimini, Ancient Mysteries says: “Much exploration has been done in the area of the Bimini Islands since discovery of the so-called Bimini Road in 1968. The Cayce readings had predicted the discovery of ruins in that area during that year.” Once again, there is NO Cayce reading that predicted the discovery of ruins in the Bimini area in 1968. NONE. It seems that those whose patience is exhausted over expectation of Atlantis rising must now make up new readings to satisfy their frustrations. But to many of us, this making up of readings is sinful because, in the original meaning of the word, to sin is “to miss the mark.” Telling the truth, as best we can, is the mark in this case. Q What great change or the beginning of what change, if any, is to take place in the Earth in the year 2000 to 2001 A.D.? A When there is a shifting of the poles. Q Three hundred years ago Jacob Boehme decreed Atlantis would rise again at this crisis time when we cross from this Piscean Era into the Aquarian. Is Atlantis rising now? Will it cause a sudden convolution and about what Year? A In 1998 we may find a great deal of the activities as have been wrought by the gradual changes that are coming about. These are at the periods when the cycle of the solar activity, or the years as related to the sun's passage through the various spheres of activity become paramount or Catamount [?] [Tantamount?] to the change between the Piscean and the Aquarian age. This is a gradual, not a cataclysmic activity in the experience of the earth in this period. I wrote to Van Auken asking him to give me the reading numbers for the six times that Cayce was asked about the Earth changes or pole shift being cataclysmic. He wrote back saying that if he had said cataclysmic, he had misspoken. How much more gratifying his response would have been had he said, “If I said 'cataclysmic,' I'm sorry. I must have misspoken. Rest assured, I will do my best to correct any impression I might have left that could have confused the assembly.” Truth be told, I feel from listening to his delivery on the tape that Van Auken made his statement to the Congress for its theatrical, not informational, effect. I also believe that Van Auken's statement was calculated to express an ARE-management, party-line position to the effect that, although the management cannot countenance the readings on pole shift and Earth changes, if such events do occur, they will be “gradual.” Unfortunately for these management uniformitarians, their position runs directly counter to the many geological catastrophes predicted in the readings to take place during and after pole shift. Catastrophes occur at a level of intensity far below the level of cataclysms. A catastrophe would be the destruction of a west coast city by earthquakes, whereas a cataclysm is “a momentous and violent event marked by overwhelming upheaval and demolition” (Webster's), like the Cretaceous meteorite impact that caused the dinosaurs to disappear. A gradual pole shift over a few month's time would cause numerous catastrophes but no cataclysms. Specifically, then, with respect to Atlantis rising (1602-3 above), this activity and this activity alone, will be gradual in nature. There may be plenty of catastrophes along the way, however. To continue with Ancient Mysteries, we read that, “Van Auken noted that, because of the continued movement of the magnetic pole, the U.S. Naval Observatory had been assigned the ongoing task of monitoring it. However, he believes that the shift is not only occurring on the physical level, but on the spiritual and mental levels as well.” This is a strange statement from two viewpoints. Firstly, the U.S. Naval Observatory has no mission whatsoever in monitoring the movement of the magnetic pole. The job of gathering data on Earth's geomagnetic field is done by NOAA. Secondly, movement of the magnetic pole has very little relevance, if any, to the pole shift mentioned in the reading above. The 826-8 pole shift deals with the movement of Earth's poles of the rotation axis. This is the movement that we plot monthly on The Hutton Commentaries' Pole Shift Monitor (www.huttoncommentaries.com). Finally, I think that it is a disservice to the membership for ARE speakers and writers to talk or write about readings-related subjects for which they have no formal training or other depth of knowledge resulting from careful research or relevant experience. And it is a crime for such speakers and writers to make up readings or alter existing ones to promote their personal agendas. Unfortunately, the first issue of Ancient Mysteries shows evidence of such tendencies. Do not, under any circumstances, make up new readings. Do not ever say or write, "the readings say...," without indicating the reading number(s) involved for the information that you are trying to communicate. [Forcing one's mind repeatedly to go over difficult readings may cause one to broaden his vision, or to see things in a new way]. If you determine later that your interpretation of a reading was wrong, and you still have access to a podium or a printing press, hasten to correct your faulty interpretation. "Records of the construction of an Atlantean power station may be found in the sunken portion of Poseidia where a portion of the [Atlantean] temples may yet be discovered, under the slime of ages of sea-water - near what is known as Bimini, off the coast of Florida..."
That this is an incorrect melding of two different readings is clear from my evaluation of reading 2012-1 near the beginning of this article, and from my re-analysis of reading 440-5 in the previous section. The error in my previous interpretation of 440-5 led me (p. 184) to speculate about how and where to search for "the Atlantean temple of records," near Bimini, "under the slime of ages of sea water," and "not in the Atlantic near the Sargasso Sea." As we all know, one error can lead to at least one more. I firmly believe that the proper interpretation of these two important readings (2012-1 and 440-5) is presented in this present article. I also wish to apologize if my writings misled any investigators searching for a Posidian temple in the Bimini area. Along with Jonathan Eagle, I now believe that this temple - or its ruins -- will be found buried on the former, late-Pleistocene land surface of the northwest Bahama Bank near Bimini, and not in the depths of the Gulf Stream off shore. G. and L. Little, Editors, October 2001 issue. Hutton, W., 1996, Coming Earth Changes, A.R.E. Press,Virginia Beach, VA, 345 p.
Zhirov, N., 1970, Atlantis, Progress Publishers, Moscow, 437 p.
THC is offering $100.00 to the first person who can verify, with a quote from a Cayce reading, the second sentence in this statement from Ancient Mysteries: "Much exploration has been done in the area of the Bimini Islands since discovery of the so-called Bimini Road in 1968. The Cayce readings had predicted the discovery of ruins in that area during that year." But there are no Cayce readings that predicted the discovery of ruins in the Bimini area in 1968. NONE. Did THC miss these readings? You be the judge.